I'm the owner of TB500 #245 and need a replacement tuner. You can see photos in the photo gallery section. Does anybody know if these tuners are still available or does anybody has one to sell. I searched the web for a long time but couldn't really tell what the right tuners are. The original tuners were Gotoh tuners, but I was having a hell of a time finding the right one (with mounting bolt plate directly center vs. offset). Maybe someone here might be able to point us in the right direction for exact replacement tuner. Gotoh full size sealed tuner set for electric guitars with 3+3 headstock. Chrome finish. 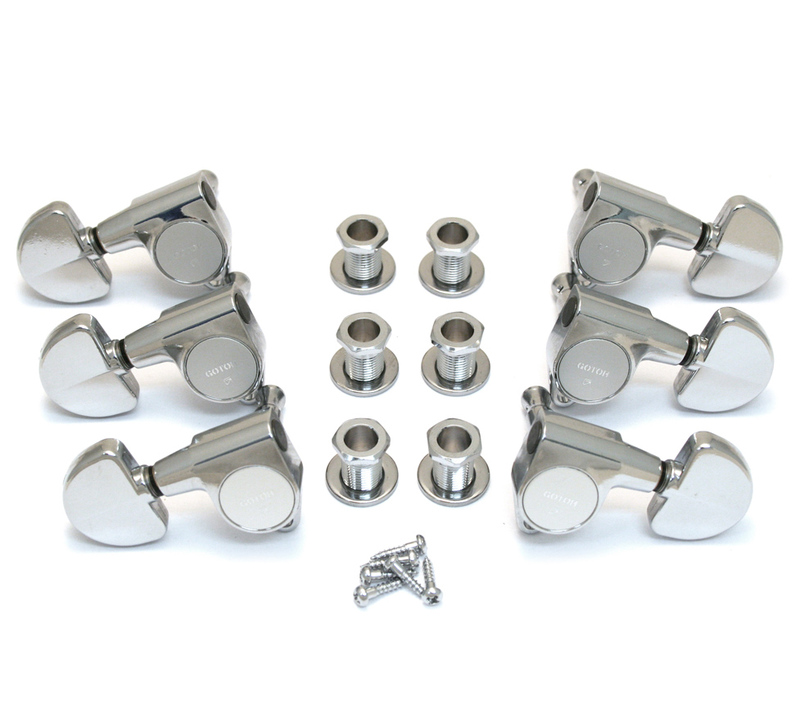 Includes screw-in bushings and mounting screws. Direct replacement for full size Grover Rotomatic." The tuners are not identical. The bottom side is open and you can see the spindle on the new ones. Also the plate that I'm missing has a little offset on the original ones. I want the guitar as original as can be. Maybe someones has some originals left. Or maybe I'm just trying to replace the plate. I just like to ask the members of the TB community if someone has replaced his TB500 tuners and has maybe one original left that he/she likes to sell to me. I have seen the same issue with the tuners on other 500s - so maybe one is left over. I have a set of original TB 500 machine heads. They are in "parts only" condition, missing many bits, but am willing to pass what is left of them on to someone who can use them to reconstruct a TB 500 to a more original state than I'm going to bother with. They are from TB 500 - 320. I can provide photos of machine heads and guitar of origin on request. if you could provide some photos to check if they are the same - would be very helpful. Many thanks for yoru offer. I've got some photos ready to go but can't find a way to post them in this forum, so I'll put them in the database under TB500 #320. Just to be clear; I now only have what you will see in the photos. I've lost the bolt bits that screw down from the top. If only I knew what I had 20 years ago I would have been more careful. (That said, I did find one top bolt thing in my bits that could well be from the Travis, can't think what else it would be from). I took a look at my tuners yesterday. They are exactly the same. Pls contact me under mr.stahl@gmx.de, then we can keep the personal stuff out of this message board. I'm trying to replace a broken schaller machine head on my TB 500. My TB 500 came with Shaller machine heads not GoToh. I purchased a set of Shaller M6 180 3 left + 3 right Large Metal. They are identical to the set to the ones on the guitar BUT the width of the collar and shaft of the new machine heads are 10mm. The original machine heads are less than 10mm. Does anyone have any suggestions?